…and yes; I said yes,… I will Yes. Since its first publication, it has attracted the interest of many censors, due to its choice of language; and its graphic descriptions of basic bodily functions. It is often described as overly pretentious and extremely hard to follow, but basically it is about a fledgling writer called Stephen Dedalus, whom some Joyceans may recall from his earlier novel “A Portrait of the Artist as a Young Man”. The story begins on the morning of 16th June 1904, where Stephen Dedalus leaves the disused watchtower he shares with Buck Mulligan, vowing never to return. He goes to his job which is teaching at a nearby school and whilst there, talks to an ageing master who gives him a letter to deliver to the offices of a Dublin newspaper. He then goes for a long walk on the beach that gives him plenty of time to ponder his literary aspirations and there is a lot of time dedicated to prose relating to a fixation Dedalus has upon his dead mother. 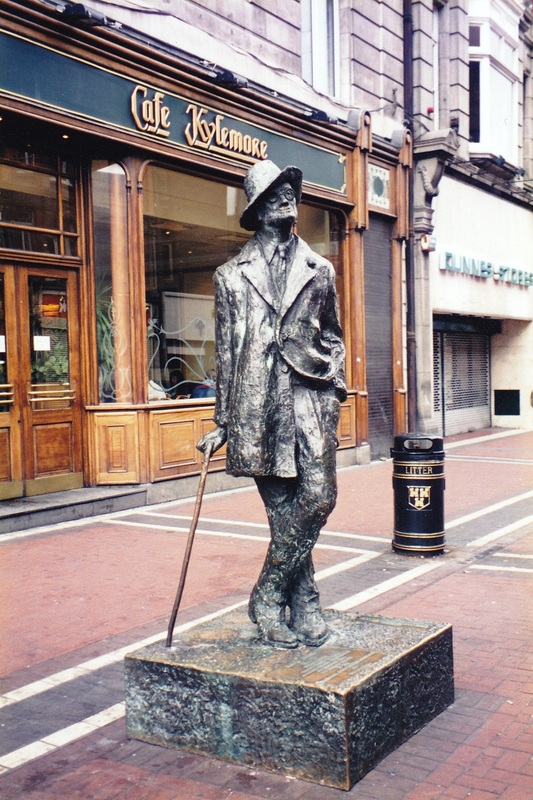 Whilst Dedalus reflects upon his life; others nearby, such as the Jewish advertising salesman, Leopold Bloom; who lives at 7 Eccles Street; eats his breakfast. Bloom’s unfaithful, opera-singing wife, Molly; meanwhile cannot wait until he leaves home so that she can entertain her lover. On this particular day, Leopold Bloom decides to attend a funeral at Glasnevin Cemetery, which mirrors the journey of Odyssey’s descent into Hades. From here on in, the story becomes a bit “murky”. There are many vignettes where Bloom and Dedalus are so close in proximity, but they just fail to meet each other in the ‘same-time-space’ continuum. For example, Bloom goes to Davy Byrne’s pub for a gorgonzola sandwich and a glass of burgundy. He then goes to the National Library where he overhears Dedalus’ Shakespearean rant. There are plenty of short dialogues and seemingly disjointed fragments, including attendance at street parades and reference to the “deadly sins.” And amongst this continual literary cacophony, Bloom narrowly avoids meeting his wife’s lover. As evening falls and on seeing two young girls on the beach, Bloom masturbates and despite near misses throughout the story, Dedalus and Leopold Bloom finally meet each other in a maternity hospital where the prose is meant to represent both the nine months of pregnancy and the birth of the English language. The subsequent ‘new couple’ of Bloom and Dedalus begin to ‘hang’ around together and listen to a tattooed sailor’s rant; they then walk back to Eccles Street together, where Bloom offers Dedalus a bed for the night; but this offer is refused. The final, and most often well known and oft-quoted part of this novel surrounds the final chapters where we are introduced to the “Molly Bloom” soliloquy. Interestingly, this 35-page final chapter consists of just 7 sentences. Examples include: “Yes” Molly Bloom sits awake in bed “yes “; and remembers her youth in Gibraltar, “yes”; and her many sexual partners, “yes”, in one unbroken stream of consciousness, “yes”, and recalls the day she, “yes”, gave herself to Bloom while eating “seed cake”, “ yes”. This entry was posted in Sculpture and tagged #Dublin, Bloomsday, Homer, Howth Head, James Joyce, Leopold Bloom, Molly Bloom, Odyssey, Stephen Dedalus, Ulysses. Bookmark the permalink.